There are those who consider themselves as “wise Christians.” – yes, is it not like this for everyone, that it does not take much for us to achieve before we start getting high thoughts about ourselves! If we only knew how many there are that stands out there and confesses that they are great sinners, with tears running down their cheeks, which in reality has great thoughts about themselves. We can see, - if we have not received a particular gift from the Spirit - only the outwardly, but never the less, the Lord sees the heart. To you who is sitting here right now, are you not aware of the fact that the Lord looks to your heart right now? - He sees that and everything else that moves throughout this whole meeting, when you go home tonight, when you wake up tomorrow etc., and throughout your life. Is this a pleasant or unpleasant thing to know for you? The wonderful freedom that this is containing - to not have anything to hide from God - is only understandable for those who lives and breathes here. What you are ashamed of before human beings, you may in totally confidentiality confess before Him and complain about the suffer it causes you. Is this familiar to you? – Or are you still trying to live the same act before God, as you so often play before human beings, to hide your true condition. The mask which is so good to have, many a time. Wise Christians, yes! Are you one of those wise Christians? We could take a test right now. And if it is going to be a real test, it has to be tested by God’s word. You shall not answer what you necessarily think is right, but be honest! Do you not want to be a strong Christian? – One who finds the power in you, and therefore conquer over sin and temptations, and goes forward with free and easy courage etc.? How long have you been doing this? Maybe for years? Paul asked three times, he says! How many times have I been praying this prayer? – 3 000 times? 30 000 maybe? Paul only asked about this three times, because he got an answer, which satisfied him - and that is an answer that concerns all of us: “My grace is sufficient for you, for power is perfected in weakness" (v.9a). You are asking to become strong; - Paul, who truthfully was a wise Christian, what did he do? “Therefore, I will rather boast about my weaknesses!” (v.9b). When did you last boast in your weakness? – Listen again: your weakness! We do not want to be weak; - we do not want to stand in the sight of God, as we in reality are, - we fight against this in every imaginable and unthinkable way, and even pray to God to hide this terrible truth, that we are nothing but helpless, lost sinners! We fight against being left standing undressed! And we cannot grasp that, this is the old man in us, who fights to stay alive. But if we let it live, you will perish, because this will not inherit the kingdom of God! (1 Cor. 15:50). This is what God nailed to the cross; - and this is what you without being convinced about, so often pray about, that God would strengthen and make strong and capable of surviving, - because you are not a wise Christian, like Paul was. Nor Paul loved this weakness, for what it was in itself; - he did not love the feeling of being weak! – No one does, no one can, - but he had had his eyes opened to a reality, exactly that the power of Christ would dwell in him! (v.9b). Many people think - when they hear true Lutheran preaching, that they should just walk around feeling miserable, - and many have probably preached that way, believing, that it is Lutheran, - but you shall know this, it is not this way! – You have no reason to walk around feeling miserable, with nothing less than Christ’s power living on the inside of you! But it is not you that should grow, you that should get strong, you that should get big and victorious etc., - but Him! This demands that we live right with God, and not walk around as pretend Christians, who make our own Christian life, and try to get God to build on it, - but those who come to Him with our sin, and on the foundation of the Gospel still have confidence and trust. He knows how bad you are, whenever you get to unfold yourself and your own; - but have you been into the light with this wickedness? Yes Lord, here you can see how it really is! This is me! Then you must be familiar with a word from the Lord: “My grace is sufficient for you!” (v.9a). Is sufficient for you! – Taste on this for a while, before you keep chasing on! Sufficient for you! – Exactly for you! I remember a few years ago, when I fell into a discussion with somebody that was very taken by the gifts of the Spirit, - and as we of course call them, extraordinary gifts of the Spirit. This is big for us, you know, to have great and very visible gifts of the Spirit to boast about, - therefore they usually pick a bouquet of certain gifts of the Spirit, that they specifically desire, - one that would make them “Kings on a hill,” or at least confirm their great Christianity. Look, we got somebody here who is living in a good and truthful relationship with God! I cannot quote this conversation word by word right now, but I asked almost like this: - Whether not great gifts of the Spirit involved suffering on us too? (Think about all of Paul’s life, like he describes it in 2 Cor. 11). Oh no! – Was the answer, - God would surely not that we should suffer, in any way! But what does Paul say? – We just read it together: “Because of the surpassing greatness of the revelations, for this reason, to keep me from exalting myself, there was given me a thorn in the flesh, a messenger of Satan to torment me--to keep me from exalting myself!” (v.7). And then I carried on asking: Do you believe that everything God gives feels good, and would you receive any gift from Him with a great thankfulness? Oh yes, - was the answer. They were so spiritual. Then listen to a gift Paul got from the Lord: A thorn in the flesh, an angel from Satan! This demon who would beat him, was not as we may think, a weakness in and by Paul, that the Lord let him keep, but it was a gift from God to Paul, - "it was given me," he says. It would serve Paul to keep him on the right track. It would serve him to salvation! I continued asking: Is there anyone of you that you would like this gift. An angel from satan who would beat you! It became silent. He was mighty wise, this Paul, - he had part in a wisdom hidden from this world, - also for most of those who are called by the Christian name, - but it was not a wisdom reserved for Paul, it is on the contrary a wisdom that the Lord desires to inform His own. The problem is that we hold on to our own thoughts. We think that we have to figure out everything ourselves, - but “I will counsel you with My eye upon you,” says the Lord (Ps. 32:8). 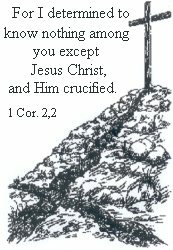 For you who call yourself a Christian, - yes, and also for you who do not, you are allowed to have a look at it too, - but you who call yourself a Christian, you have been commanded tonight, from God’s own word, - to fix your eye on the crucified Jesus Christ, and answer in the deep of your heart: Is this enough what is happening? – Is it enough for God? Is the answer YES or NO? That, and only that, determines whether you can leave this service tonight with a uneasy and restless heart, or with a hallelujah shout in you! Paul, who has borrowed both tongue and mouth from the Holy Ghost for us tonight, he also testifies: “For I determined to know nothing among you except Jesus Christ, and Him crucified.” (1 Cor. 2:2).